Today — our fourth design board to create a 1940s style kitchen. This one uses Lauryn and Dennis’ 1939 super-successful kitchen makeover as inspiration. The key starting point: Buttercream yellow cabinets. There are many ways to retro [<- I just love it when I used that as a verb], including 1940s style. Lots of readers seem to be totally nuts over 1940s kitchen style, so here’s my second mood board including resources to create a 1940s or early 1950s style homey comfy sweetheart kitchen. 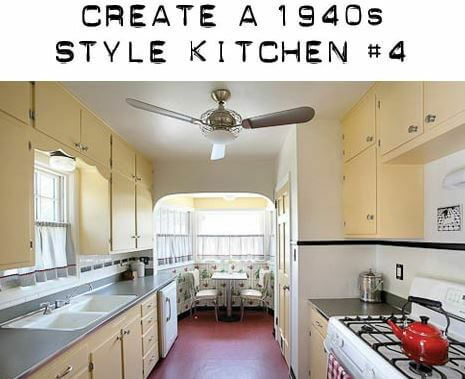 Here’s my first mood board, complete with resource links, to recreate a 1940s kitchen design.